Uber had lived a charmed existence until its breakneck growth and mostly ruleless company culture caught up with it in 2017. The world’s most valuable startup has since shuffled its leadership, messaging and branding in hopes of “growing up”, as it stabilizes its core business and reputation. The reshaped branding and messaging has been apparent in their TV advertising strategy, where they apologize for past sins. New CEO Dara Khosrowshahi is placed front and center in the ad below, as the company tells the world they’ve moved on from founder CEO Travis Kalanick, and the culture he built. Does their strategy on paid social reflect this? Not really. 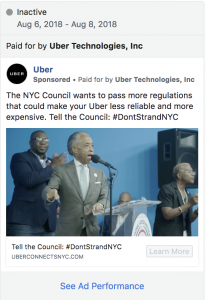 While they are spending directly to promote some of their better media coverage lately, a bulk of their Facebook advertising effort has gone into what has historically been their bread and butter – product-heavy direct response messaging. 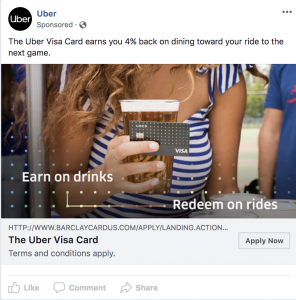 It’s not perfect – they inexplicably do not have a new user offer for their ride hailing service and get a little too specific with their credit card offers, but they’re generally pretty good. Comment: I don’t drink Rosé, but Facebook knows that a lot of people do, and who those people are. I imagine Facebook is showing this ad to lots of millennial-aged women, because that’s who’s responding to it. 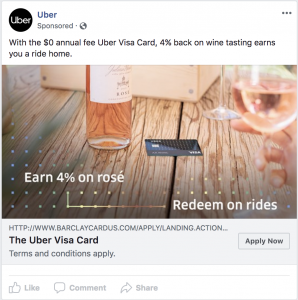 I’m skeptical that calling out “wine tasting events” as an item to get 4% back on really moves the needle, as the offer is actually much better than just “wine tasting events”. You get 4% on all restaurants and bars. I imagine lots of people read this and think, I only go to 1 wine tasting event a year, why do I care if I get 4% back on it? Comment: Attractive silhouette, beer, striped shirt. Yes, this ad will get men to stop scrolling. While there are lots of women that like to drink beer at sporting events, I imagine Facebook’s algo is showing this ad to far more men than women because it’s performing better with them. It’s a decent counter-play to the Rosé ad. I wouldn’t specifically call out 4% reward “toward your ride to the next game” because I don’t think people think that way. I’d just say “4% back so you can watch the next game with a little more dough in your pocket,” or talk about how it’s the most valuable cashback offer for bars and restaurants available on the market. It’s still a reasonably effective piece of copy because 4% back on dining is a completely powerful offer to anyone that likes to watch sports in the fall and drink beer out while doing it. Comment: 50 million people is pretty solid social proof. I bet this is a winning ad for them. I like the first person perspective of the app open with the simple prompt “where to?”. It’s prompting the prospective new customer to download the app and go somewhere right now. They’re building urgency and addressing the token resistance most apps face, where the user doesn’t want to spend much time getting signed up. Always say “in minutes” if you have a great funnel and a responsive service. I think they’re missing a true value-proposition in this ad though – holding it back from being perfect. Why not get them through the door with a new user discount or free first ride? Comment: Uber’s lobbying effort in New York utilized an Al Sharpton clip with no context. He says “where will we start seeing services in our community? That our concern is that we do not want our communities underserved. It aint got nothing to do with nothing else”. I guess you can argue that Uber helps underserved communities, as its GPS and rider/driver rating system makes it a safer alternative to taxi cabs. Fair. Good copy in the ad though – people love Uber because it’s cheap and reliable. This ad calls out NYC Council for threatening that. I didn’t see any ads designed specifically for lapsed users and retargeting, which I think is a bit of a mistake. 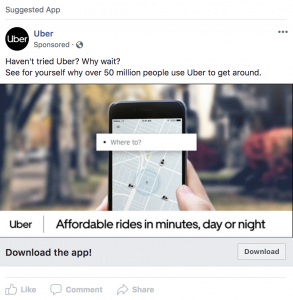 Other than that, I think Uber’s doing a decent job with their creative, messaging, and strategy on Facebook and Instagram advertising. They’re trying to win back your heart with their TV ad apologies, and they convert you when you’re on your phone – a tap away from a download. I don’t think they’re hitting any homeruns with their creative – none of these have potential for crazy virality and incredibly low cost per acquisition, but they’re likely consistently effective enough for Uber to spend substantially on them. A Cryptocurrency Portfolio: Bitcoin vs Ethereum vs Alts?